In Translating Empire, Laura Lomas uncovers how late nineteenth-century Latino migrant writers developed a prescient critique of U.S. imperialism, one that prefigures many of the concerns about empire, race, and postcolonial subjectivity animating American studies today. During the 1880s and early 1890s, the Cuban journalist, poet, and revolutionary José Martí and other Latino migrants living in New York City translated North American literary and cultural texts into Spanish. Lomas reads the canonical literature and popular culture of the United States in the Gilded Age through the eyes of Martí and his fellow editors, activists, orators, and poets. In doing so, she reveals how, in the process of translating Anglo-American culture into a Latino-American idiom, the Latino migrant writers invented a modernist aesthetics to criticize U.S. expansionism and expose Anglo stereotypes of Latin Americans. 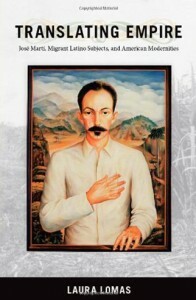 Lomas challenges longstanding conceptions about Martí through readings of neglected texts and reinterpretations of his major essays. Against the customary view that emphasizes his strong identification with Ralph Waldo Emerson and Walt Whitman, the author demonstrates that over several years, Martí actually distanced himself from Emerson’s ideas and conveyed alarm at Whitman’s expansionist politics. She questions the association of Martí with pan-Americanism, pointing out that in the 1880s, the Cuban journalist warned against foreign geopolitical influence imposed through ostensibly friendly meetings and the promotion of hemispheric peace and “free” trade. Lomas finds Martí undermining racialized and sexualized representations of America in his interpretations of Buffalo Bill and other rituals of westward expansion, in his self-published translation of Helen Hunt Jackson’s popular romance novel Ramona, and in his comments on writing that stereotyped Latino/a Americans as inherently unfit for self-government. With Translating Empire, Lomas recasts the contemporary practice of American studies in light of Martí’s late-nineteenth-century radical decolonizing project. Lomas, Laura. Translating Empire: José Martí, Migrant Latino Subjects, and American Modernities. Duke UP, 2009.